Broadside Electric may be folk music's answer to death metal. Its self-described "folk music with teeth" includes all the violence and mayhem of old Celtic songs, executed with a plugged-in sound. "There always was in music this kind of horrific, murderous angle to it," says founding member Jim Speer. "Its in rap now and in death metal now and it always was there. People think its some sign of the times in the 20th century that music is so violent. That's total crap. The roots of this go back as far as there was music." Actually, Broadside Electric isn't completely about murder and mayhem. That's just a small part of this 7-year-old Philadelphia-based band's repertoire. The band uses an assortment of obscure instruments, and its set list is chock-full of old ethnic ballads. What it plays was folk music to the world centuries before Peter, Paul and Mary watered it down. "People think about singer/songwriters and think about our music as some sort of sub-genre," Speer said. "But that's kind of a skewed view, because if anything, those are the traditional roots of modern folk music." 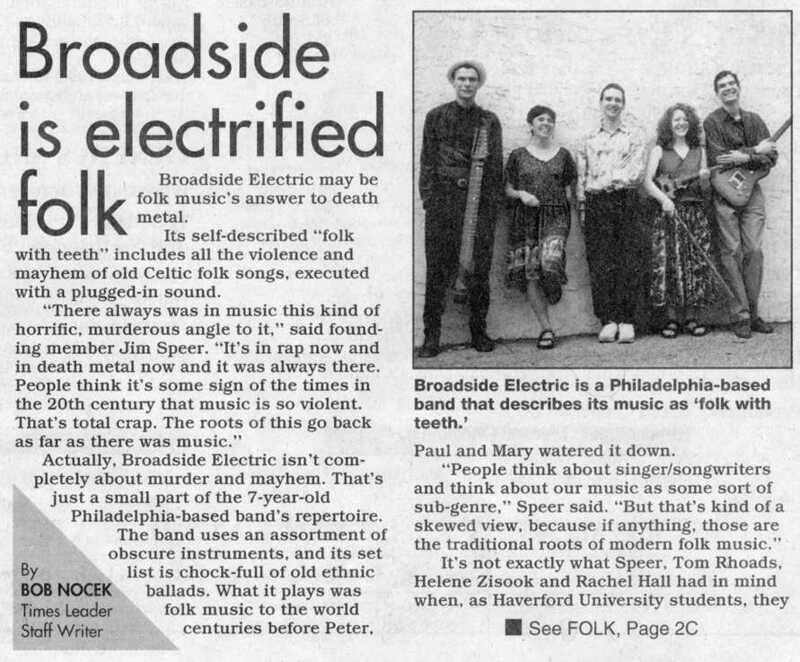 It's not exactly what Speer, Tom Rhoads, Helene Zisook and Rachel Hall had in mind when, as Haverford University students, they began performing songs by 1970s English folk groups such as Fairport Convention, Silly Wizard and Steeleye Span. "We were entranced by that sound," said Speer. "We knew what we wanted. What we got was something different." When Melissa Demian replaced Hall in 1991, her dulcimer became the group's primary rhythm instrument. And even though she eventually left, Demian's influence helped nudge the band towards Eastern European music. Balkan folk ballads and klezmer music, a joyous sound often heard at traditional Jewish weddings, became part of the group's set list. "It's becoming less uncommon," said Speer. "There's a lot of groups doing klezmer music, and it's a big thing among klezmer bands to modernize klezmer music with drums and electric instruments. It's also a big trend among electric folk bands to do some klezmer as well. I suppose we're trendy." Broadside Electric uses its share of traditional instruments, including guitars and basses and violins (albeit electric ones), but it also has incorporated some older, rarer European instruments. So many, in fact, that the band's website includes an encyclopedia of the instruments they use. Speer plays a Chapman Stick®, a flat fret board with 10 or 12 strings that is hung from a shoulder strap. the strings are tapped with both hands. They play rare woodwind instruments like the crumhorn, which looks like a large umbrella handle and sounds like a bagpipe, and the rauschpfeife, which was designed to be played outdoors, and therefore has a very loud sound resembling a muted trumpet. Two new members added this summer (since 1994, the group has been a trio of Speer, Rhoads and Zisook) have added to the group's instrumental range. Joe D'Andrea is a drummer, and Amy Ksir plays tin whistles and other wind instruments. "It's terribly exciting when we have new members contribute new sounds," Speer said. "I'm really liking the sound with the new members, and I think we have a bigger and more complex sound than before." Stick, The Stick and Chapman Stick are registered trademarks of Stick Enterprises, Inc.